This week, I am featuring Lisa White from Alternative Chef Kitchen, which is an amazing web-based cooking show where each episode focuses on a popular recipe and each chef cooks their version of the recipe for people who have intolerances or allergies, whether that be to gluten, dairy, egg, soy or meat. I’m a naturopath and a mum (my kids are aged 6 and 5). I was always interested in health and nutrition and helping people back in high school (I also would have loved to be an astronaut or a romance writer;-) because of my interest in nutrition that inspired me to study a Bachelor of Science degree with the intention to go on and study nutrition but the Masters course which was available at the time was getting restructured so I undertook an Honours project in Reproductive Biology instead and “accidentally” spent another 6 years in research because I found it really interesting (although I never really wanted to be a career scientist and wanted to work with people (rather than just cells;-). While I was studying a friend suggested I see a naturopath. I’d never even heard of it before but I was fascinated from that very first appointment because it really resonated with my approach to health. I didn’t love all the chemicals I was working with in the laboratory and my philosophy and approach to health was more pro-active rather than reactive. So I eventually discontinued the PhD candidature and started studying Naturopathy, Nutrition and Herbal Medicine instead.When I was in my 30s I discovered I had a large ovarian cyst and endometriosis. I’d been following the lower carb more paleo style diet advice which our nutrition lecturer promoted as the healthiest diet, but over the years of following that advice, while I’d been slender, I was always exhausted and my menstrual pain and migraines had been getting worse, so it wasn’t the best advice for me and I discovered by chance after doing a raw food cooking course that avoiding meat mitigated my menstrual pain and migraines and so I became fascinated with plant-based diets because we were already avoiding dairy as a family, I wanted to make sure we could be healthy following a mostly plant-based diet. I’d been mostly avoiding dairy since I was 14 because it exacerbated my eczema and my children both had sensitivities to it. My daughter had a dairy and soy allergy as an infant which luckily she grew out of but still remained intolerant to and my son also got eczema and so with discussion with our paediatrician we decided to continue avoiding dairy. 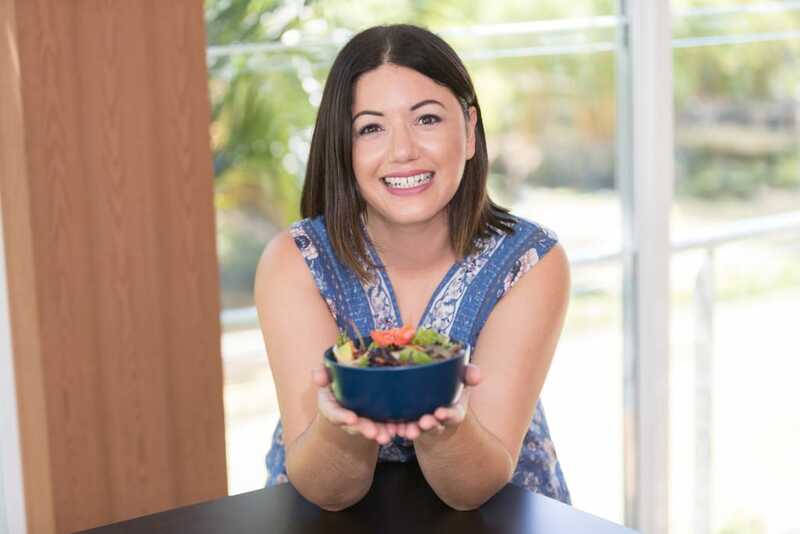 I use nutrition, herbs and lifestyle approaches in my clinic and I’m constantly fascinated by how seemingly simple dietary and lifestyle changes can make such big changes to their health. Although I understand first hand just how hard it can be to “find the time for healthy cooking and exercise” when you’re a busy mum or busy passionately working on projects that you love. What inspired you to start Alternative Chef Kitchen? When I was pregnant with my daughter it was the year MasterChef had started here in Australia and I was addicted. I loved the show, but I kept saying to my hubby Brenton “Wouldn’t it be cool if there was a TV show that catered for people with food intolerances?” Because there were few of their recipes that I could actually eat. Then after my daughter was born and we discovered she had the dairy and soy allergy I’d watch Good Chef Bad Chef (with Janella Purcell) and I loved that Janella cooked without dairy and meat although some of her recipes included soy and I thought it would be really cool if there was a cooking show that showed people alternatives to soy, because it’s the most common dairy alternative, but sadly, not everyone can tolerate it. So one day after a couple of years talking about my “Alternative Chef” cooking show idea, I was chatting with my friend Anne, who I’d met when I did one of her romance writing courses years before and she said “Why don’t you do it?” I’d laughed because I knew nothing about video, lighting, editing, or food styling but I went home and began writing some plans for a pilot season. I knew I wanted it to be just about cooking with the alternatives, and not ladden with “you should be eating or doing this” messages because there is just so much of it out there, and I think people are getting tired of being told what to do. I also wanted the show to be inviting, so that anyone who liked cooking shows (but had a restricted diet for one reason or another) could get something out of it – whether they’d never walked into a healthfood store before, or they considered themselves a seasoned “whole-foodie”. When it came to writing the recipes, I included recipes in season 1 that I know from clinical experience that people struggle the most with – as well as some fun ones and then I met Hayley and Glenys and we filmed our Cheesecake Episode which is the season 2 premiere episode and we were all pretty shocked that it actually looked like a real TV show considering it wasn’t filmed in a studio and we were all amateurs. So then we decided to film the Lasagne Episode (which is the season 1 Premiere episode) and we were lucky to have Neale Daniher (former AFL player, and coach) as a special guest and after that we decided to go ahead and film the rest of the episodes. In 2016 we’ve got 14 new episodes which is amazing. I really love pushing the boundaries of what people think is possible when it comes to whole food, plant-based or food sensitivity friendly cooking. So while we’ve kept the same format for season 2 – with each of the 4 cooks showing a different way to cook the theme recipe so that it’s suitable for different dietary needs, we’ve had a lot of fun and brought in some comfort foods as well as the healthy practical foods. We’ve shown the Cheesecake episode which features 4 different dairy free cheesecakes, 3 of which are also gluten, soy, egg and gelatine free and one which is a lemon free lemon cheesecake. We’ve shown a dairy and meatless BBQ with the most delicious home made meatless sausages, raw BBQ onions and dairy and egg free coleslaw, and an Ice cream alternative episode with 4 different ways to make a creamy dairy-free ice cream and we’ve got so many more episodes with think-outside-the-box alternatives coming up. Also very exciting is that we’ve just released our ecourse I had the idea for this right at the beginning when I first thought about the show because I understand first hand how people have different styles of learning when it comes to this kind of thing and so I really wanted to bring that “to the table” so that people who needed a bit more help making changes to their recipes, could have it as well as really helping people to understand how to minimise the chance of developing nutrient deficiencies. Because it’s so “trendy” nowadays to avoid certain foods and there is a lot of misinformation around on the internet I wanted to give the course participants some practical skills they could apply and some red flags so they know what they need to follow up with their healthcare practitioner. Like our show there’s nothing like the course out there so it’s pretty exciting. There are some great videos in the course too covering things like the kinds of tools which make cooking with alternatives easier, different food preparation techniques, how to make substitutions and also natural food colouring alternatives. I’d love to release another recipe book this year too if all goes well because we’ve had some great feed back and reviews of our first book. My motto is to “make the most of the resources you have in your time, your kitchen and your budget.” There’s a lot of idealism and “purist” advice online and I find it can make the process of change really overwhelming. This health journey isn’t a sprint to the finish, it’s a lot more like a marathon. So it’s better to make small changes that you can sustain rather than making many changes that you can’t sustain past two weeks. The other tip I’d give is to start with adding more veggies. Don’t get caught up in the details or the differences – eg whether the “ideal” diet is paleo, or plant-based or the standard American or Australian diet. Look at the things that everyone agrees on and start with that – especially if you don’t have any food sensitivities or other health conditions limiting your options. Start with adding the veggies and whole foods and then take it from there. A few changes at a time, practice a few new recipes or techniques at a time and the changes will be more sustainable. Legumes and whole grains are pretty inexpensive forms of protein and fibre which are filling and when prepared properly – pretty nutrient dense too so by adding more of these meals into your diet it’ll certainly cut the costs. The other useful tip is to buy fruit and veggies that are in season and if you buy organic veggies, you can keep the scraps for stocks etc. When people are time poor – my two main recommendations are to either make a few recipes on the day of the week you are free, or alternatively to make things which don’t take long to cook. Great batch cooking recipes include soups, casseroles, curries or pie fillings. I also make up a “bolognase” by throwing some lentils (about 1 cup), sun dried tomatoes (1/2-3/4 cup) and some walnuts (1/2-3/4 cup) in the food processor and blitzing until it has a “mince” consistency (you can add garlic and onion too if you like and or some herbs) and then I stir that through our favourite pasta sauce and either make a lasagne or we have it with spaghetti or pasta. I really love reading, so I enjoy doing that, and I also love to go to the shops and just take my time looking (as shopping with the kids is usually a more rushed experience. I also love going to my favourite cafe and having a chai or a meal. One of my favourite recipes at the moment is Glenys Sizzling Meatless Sausages from our BBQ episode (they are seriously yummy!) we serve them with some salad and BBQ onions and BBQ sliced potato. Sautee the sliced mushroom and chopped onion in some olive oil. In another frying pan, dry roast the spices. To a large bowl, add the remaining ingredients together and mix – if it is too dry add a little water. Add the spices and mushrooms to the mixand combine the ingredients. Moisten your hands with some water and shape the mix into sausages. Set up the steamer with some foil as a lining, and place the “sausages” into the steamer and steam for 20 minutes. Once cooled rollthe sausages in polenta (you may need to re-shape them a bit) and put them back in the fridge to cool (uncovered so they “harden up” a bit. Fire up the barbecue and cook them. Adding extra oilve oil to the barbecue will help them get the “charred” appearance and the smoky barbecue flavour. Lisa White is a Naturopath, published author, cooking show producer and presenter, e-course creator and recipe writer for IndieLove Magazine. She runs a naturopathic clinic in Adelaide, South Australia where she lives with her family.